It is not every day that you get to see a hummingbird. 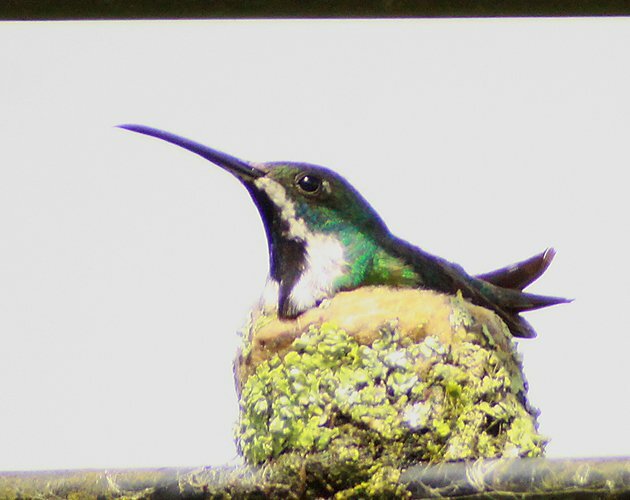 It is even rarer to see a hummingbird on its nest, seeing as they tend to be pretty well camouflaged. But when a hummingbird chooses to nest on overhead wires it is quite a bit easier to spot. Such was the situation on Saturday morning in Trinidad when Mukesh Ramdass, who was guiding me for the day, suddenly pulled over and told me it was my lucky day. He pointed this female Black-throated Mango out to me and I spent a few minutes digiscoping it. 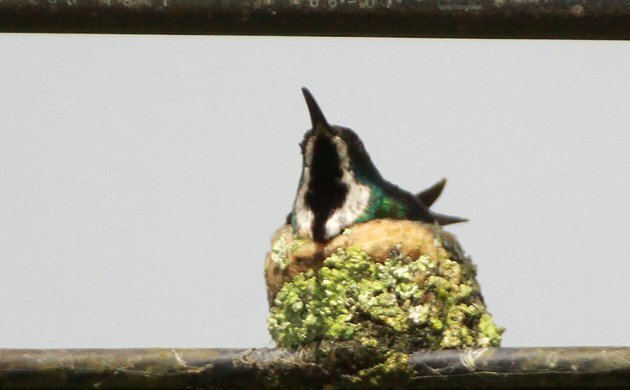 What I found really amusing was how the hummingbird had still used lichens on the side of the nest as if the lichens would hide it like they would on a more traditional nesting site, like a tree branch. I was also surprised at how used to traffic this bird had become. It didn’t even flinch when large trucks passed within feet of its nest! Mukesh informed me that this particular nest had been used previously and also let me know that hummingbird nests are often reused in Trinidad. I had no idea! There is much more to come from my amazing five days in Trinidad and Tobago so make sure to stop back soon for more. Nice! I miss hummers here in the old world, all we get to see are those obnoxious cars that were sold to locals by the leaving American troops. So I guess you’re not at 353 for the year anymore? Jochen, I still have to do the counting but it will be at least 100 more, probably more than that. Heck, I had about 75 life birds! Amazing that the nest is the size of a quarter, and you can see every lichen it’s made up of… super photo! Thanks for sharing.